With osteoarthritis, the cartilage and bones within a joint begin to break down. These changes usually develop slowly and get worse over time. Osteoarthritis can cause pain, stiffness, and swelling, and can result in disability. If you’re living with osteoarthritis, you’re not alone. It affects over 30 million adults in the US, and the knee is one of the most commonly affected areas.1 75% of patients suffering from chronic pain are also suffering from knee and/or hip pain. You may have noticed a constant, annoying, throbbing pain in your knee. You met with your physician and were diagnosed with chronic pain or osteoarthritis (OA) of the knee. Your physician may have prescribed several conservative therapies such as physical therapy and OTC medications that may provide temporary relief, so you can still enjoy your daily activities. It’s been some time since your chronic pain/OA diagnosis, but your go-to therapies may not be cutting it anymore and simple tasks wear you down. You may start seeking help from other specialists who might recommend prescription NSAIDs, or maybe even opioids. You may have lived with the pain for some time now, and your doctor may be suggesting more invasive therapies such as steroid injections. But long-term relief and safety may give you pause, so you and your doctor could discuss COOLIEF* as an option. Your pain is getting worse. You may have tried steroid injections, but you may not be ready for another round and need lasting relief. Your doctor may have brought up surgery, but you aren’t ready yet. What else is there? Maybe discuss COOLIEF* with your doctor. You may be feeling terrible pain. After several different therapies, you still haven’t found relief that lasts. You’re not ready for surgery yet, so what are your options? Ask about minimally invasive COOLIEF*. 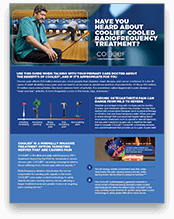 COOLIEF* is the first and only radiofrequency treatment cleared by the FDA for moderate to severe OA knee pain. 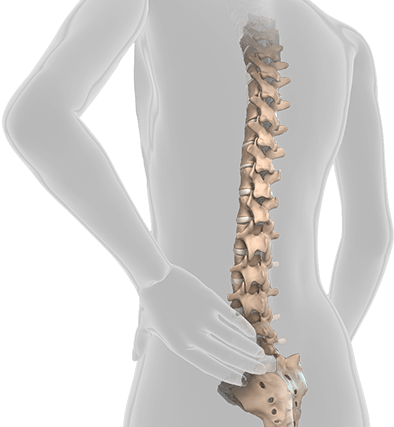 It is a minimally invasive, non-narcotic procedure that treats chronic back, knee, and hip pain and can last for up to a year (for some people with chronic back pain, up to two years). See our TV commericals here! Centers for Disease Control and Prevention. Osteoarthritis fact sheet. https://www.cdc.gov/arthritis/basics/osteoarthritis.htm. Accessed May 3, 2017. National Institute of Neurologic Disorders and Stroke. Low back pain fact sheet. https://www.ninds.nih.gov/Disorders/Patient-Caregiver-Education/Fact-Sheets/Low-Back-Pain-Fact-Sheet#3102_3. Accessed March 12, 2018. KS&R, Inc. Halyard-sponsored qualitative market research, OA Pain Landscape & Patient Journey. 2015. Data on file. American Academy of Orthopaedic Surgeons. Information Statement 1045: Opioid Use, Misuse, and Abuse in Orthopaedic Practice. October 2015. Physiopedia. Numeric pain rating scale. https://www.physio-pedia.com/index.php?title=Numeric_Pain_Rating_Scale&oldid=174322. Accessed April 19, 2018. *Registered Trademark or Trademark of Avanos Medical, Inc. or its affiliates. © 2019 AVNS. All Rights Reserved. There are inherent risks in all medical procedures. Please refer to your physician for Indications, Cautions, Warnings, and Contraindications. Your physician is responsible for performing the procedure per instructions. For specific questions regarding the procedure, please contact your physician. Individual results may vary; talk to you doctor about how COOLIEF* might help you.